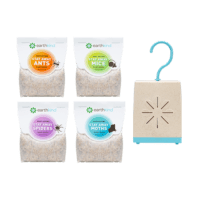 1 each of Stay Away® Ants, Moths, Spiders, and Mice plus a Pouch Pod. No mess. No harmful chemicals. No pests, guaranteed! 1 each of Stay Away® Ants, Moths, Spiders, and Mice.